This beautiful and big quilt was designed and made by myself, whilst recovering from a broken foot. Without sounding melodramatic, I felt that I myself was at a cross roads whilst trying to be on crutches for 4 months and look after two toddlers. A point in life where one needs to choose the path of being cheerful! Junction is a simple quilt, with straightforward piecing techniques, and the features fabrics are made entirely from one jelly roll and one mini charm pack, ideal for using those pre cuts in your stash. 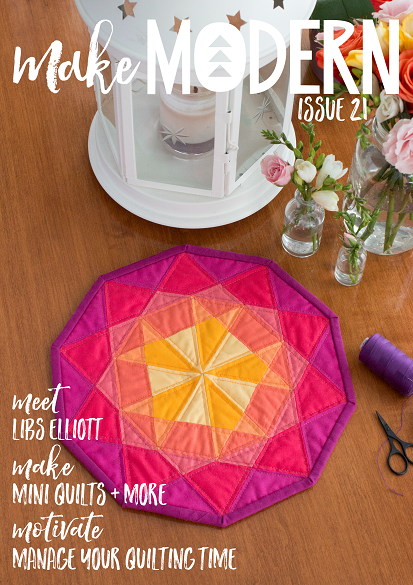 The pictured quilt was made using fabrics from the Little Ruby collection by Bonnie and Camille for Moda fabrics, with the backgrounds made from Moda Bella Solids. Create your own look and styled quilt in your choice of colours and fabrics, or follow the pictured example. The finished quilt is a very big quilt, at 91" square, making it ideal to drape generously over a Queen sized bed. However, the quilt can be easily adapted to a larger or smaller quilt, depending on your preference. The quilt is made from 9 large blocks, finishing at 30" square each. The quilt can be made from pre cuts of a Jelly Roll and a Mini Charm Pack, but can also accommodate fabric from your stash, or scraps. Extra fabric is required for the background, binding and backing etc. 60cm (23”) Red Stripe print for binding.